Time for a look at the jewels worn by the royals to celebrate Easter Sunday across Europe! In Palma de Mallorca, the Spanish royal family gathered to attend mass. Queen Letizia wore an interesting pair of chunky gold earrings with her bright pink coat. Queen Sofia donned her usual layered necklaces, including one that features tiny Easter eggs. She also added a gold brooch to her patterned coat. At Windsor, the British royals gathered for their traditional service at St. George's Chapel. The Queen wore one of her favorite brooches: the Frosted Sunflower Brooch. The Yorks were in attendance, but as per usual, Beatrice wore no jewels while Eugenie wore a pair of drop earrings. I've not read a positive ID of the earrings, but their shape reminds me quite a lot of Monica Vinader's pieces. 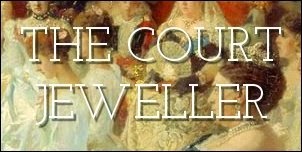 The Countess of Wessex wore a pair of trendy back-to-front earrings with a darker front stone and a pearly back stone. Sophie's daughter, Lady Louise, also wore a bit of jewelry at the service: a necklace with a pendant shaped like a horse. Princess Anne wore the same gold brooch -- shaped like a loosely-knotted ribbon -- that she wore last year for the ANZAC Day service in London. Anne's daughter-in-law, Autumn Phillips, wore a classic pair of pearl stud earrings to church. Now that they're no longer reigning, King Albert II and Queen Paola of Belgium appear to be spending quite a bit of time in her native Italy. On Easter Sunday, they attended mass in St. Peter's Square in Vatican City. Paola wore pearl earrings -- and you'll note that she's stopped exercising the privilege du blanc (the right of a Catholic queen to wear white when meeting the pope) since her husband's abdication.